When Wessex Water engaged Terra Solutions to construct- through Shaft sinking- a new Pumping Station to service the ever growing population in Yeovil, they knew that they had employed The Trenchless Experts, as this was just the latest in a series of successful shaft installations for Terra. That is not to say, however, that the job was completely without its challenges for Terra. In this particular area- given the close proximity to the river- there was a real threat to proceedings in the form of ground water, so Terra prudently drew up a ground water management plan. Care was also taken before breaking ground to make sure that there were no archaeological complications, with the site being located only a short drive from the Sweet Track, one of the oldest artificially manufactured roads/paths ever discovered and was built in either 3807 or 3806 BC. To begin, Terra excavated the section of ground the where the shaft would be constructed, this was of sufficient size to build the cutter choker and install a concrete collar. Sufficient space was left to install the 1000mm x 2500mm concrete collar around the outside of the segments. The cutting shoe & base ring were constructed, and a second ring was placed on top. The second ring provided the necessary additional height to hold back the concrete in the collar, acting as an internal shutter. The concrete guide collar was poured and allowed to set around the 1st rings. Before the concrete set, scaffold poles were placed to form a handrail around the shaft and act as edge protection. Once the collar gained adequate strength a third ring was built, and subsequent rings provided the additional weight necessary to allow the shaft to drop under its own weight, removing the need for hydraulic jacks. This is known as the Caisson method of shaft sinking. The cutting shoe & base ring were surrounded by a polystyrene wrap- to create an annulus- so the shaft was free to move once to concrete had cured. Terra Solutions excavated the ground within the shaft in a controlled and methodical manner, the object of this being to avoid the over excavation of any one area more than another. As the shaft began to move the next ring was constructed on top of the previous rings. Once the bucket of the excavator was no longer capable of reaching the material to be excavated, a hydraulic clamshell grab was fitted so that Terra could gain the extra arm length needed to continue excavating the bottom of the pit as set out in the design. Each ring in this instance consisted of 8 back bolted shaft segments and were tied into the ring below using T-Bolts, forming one solid structure. These ring segments were supplied by FP MCcann. As a shaft is being constructed via the Caisson method it is necessary to lubricate the segments to reduce ground friction around the perimeter of the shaft. For the Yeovil Pumping Station, Terra Solutions utilised a Bentonite based lubricant, mixed in an air operated paddle mixer and pumped into the annulus which was created by a polystyrene wrap, which broke the bond between the rings and the collar, allowing the shaft to start sinking. 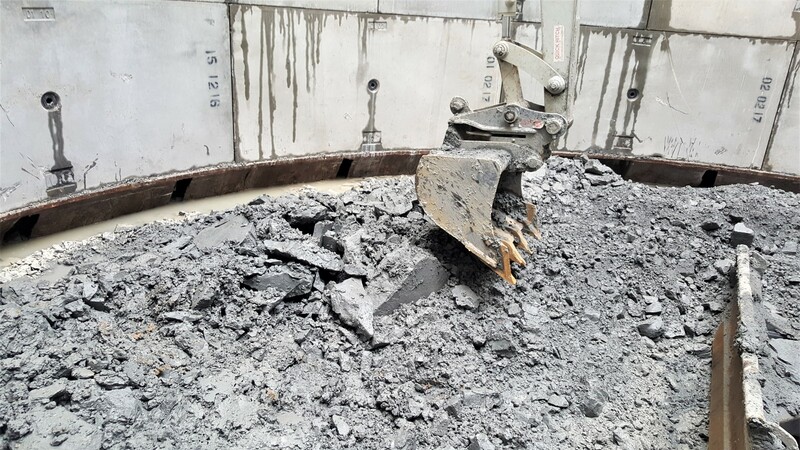 At 6m down rock was encountered a hydraulic breaker was used to excavate this harder material, a 4m extension on the breaker enabled excavation from ground level with minimal confined space working. The operatives only entered the shaft to trim around the cutting shoe with a mini digger.Adequate air moving equipment and ventilation was provided at this stage and safe systems of work for confined spaces followed. When the correct depth was achieved, a 1.5m deep concrete plug was poured using a 32m concrete pump. A sump was installed through the base plug to ensure that any groundwater ingress did not affect the integrity of the concrete, this pumping would be maintained until the RC base was cast. A reinforced base was tied and dowelled to the shaft walls to create a 500mm thick reinforced base. The concrete for this was pumped to the base. At this point the base and the walls of the shaft formed one solid, concrete structure. The previously installed sump was bunged off and sealed by the RC base. The annulus behind the ring segments were grouted using a threaded grout gun, starting from the bottom of the shaft and moving upwards, maintaining the structural integrity and preventing future ingress. One of the final elements to this project was to caulk and point the shaft. When complete, the shaft had a smooth internal surface to be fit for purpose as a pumping station. The pointing took place from inside a man-riding basket which was attached to a crawler crane, with an operative inside wearing a harness attached to a fall arrester, maximising his safety. To complete this project all that remained was the installation of the slab over the footprint of the works. This came in 3nr pieces, the heaviest of which weighed approximately 20.64Ton. A mobile crane was used to offload the cover slab which came on 3nr articulated lorries, and was placed from here directly onto the newly constructed pumping station shaft, slotting into place perfectly as per the design. 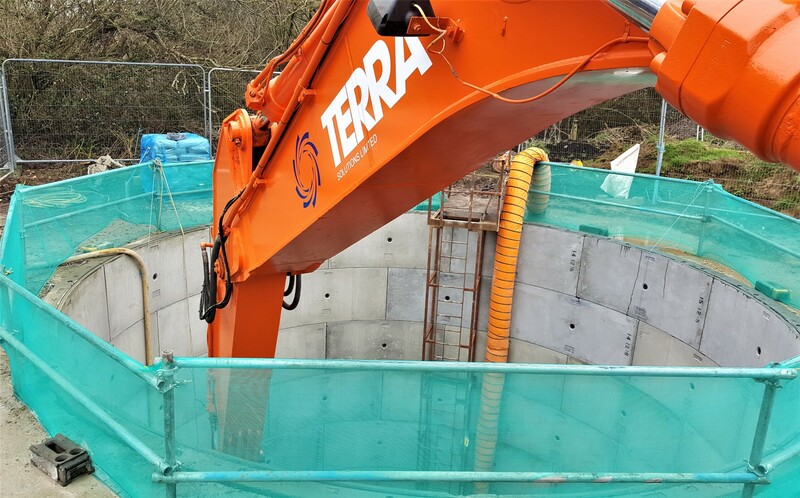 Without running into any complications or any obstacles that could not be overcome, Terra solutions were able to construct the new pumping station to the specifications of the client both on time and on budget, maintaining a close relationship with Wessex Water that can be taken forward to ensure the successful completion of future projects.